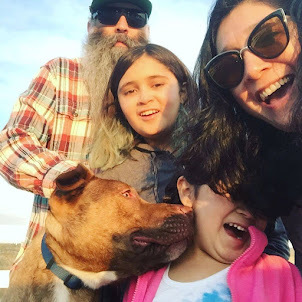 Punk Rock Parents: We Got A Dog! We searched and searched and the stars finally aligned. Over Thanksgiving weekend we headed back from Santa Barbara early and made a trip out to Riverside to the Mary S. Roberts shelter. We see their volunteers every month at Art Walk. They also had a dog adoption event in my business center about a week earlier. We knew that they were having free animal adoptions for Thanksgiving weekend. "What are you here to see?" And we were like "Uhh dogs"
And they were like "There is only 1 dog left." and then they added, "And a couple that drove up from Oceanside is having a meet and greet with him". At that point I thought for sure we had wasted a trip. They asked us if we wanted to wait, just in case the couple passed on "Prince". When I heard his name was Prince I assumed he was an old foo-foo tiny dog, who was probably ugly, because why else would he be the only dog left. The Oceanside couple passed and we were lead into the little meet and greet room to hang out with "Prince". He was not little, foo-foo, or ugly. 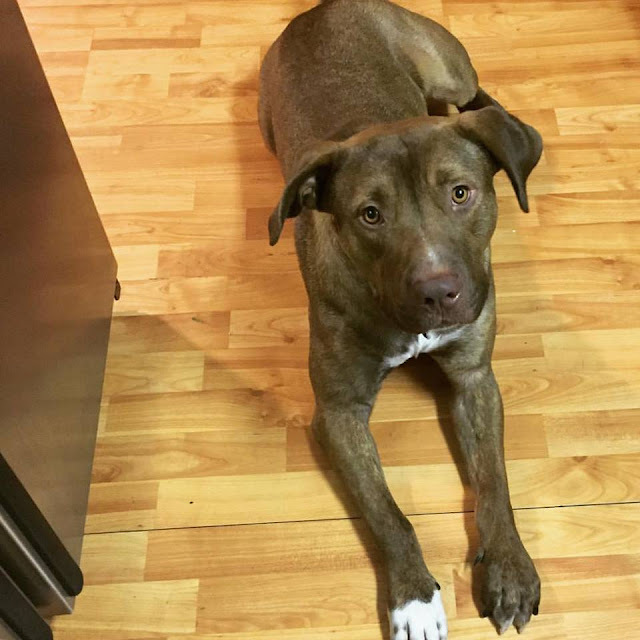 He was a 2 year old lab/staffordshire terrier mix with a gorgeous brown/reddish coat and light brown eyes. He was sweet and quiet and hung out. After our last meet and greet experience we were all a little bit hesitant to really let ourselves fall for him. He was a little bit bigger than we wanted but at 2 years old he was full-grown. We all played tug with him and threw his toys for him to catch. We were in there for about 15 minutes and I asked the family what they thought. It was unanimous, we all liked him. He looked a lot like the puppy from the sad shelter experience, but all grown-up. We filled out the paperwork and learned a little more about this guy. He had been at the shelter on and off for 5 months, and returned twice. Love how they threw that piece of info in AFTER the meet and greet. They explained that his first owner had to move into an assisted living facility and could not take dogs. 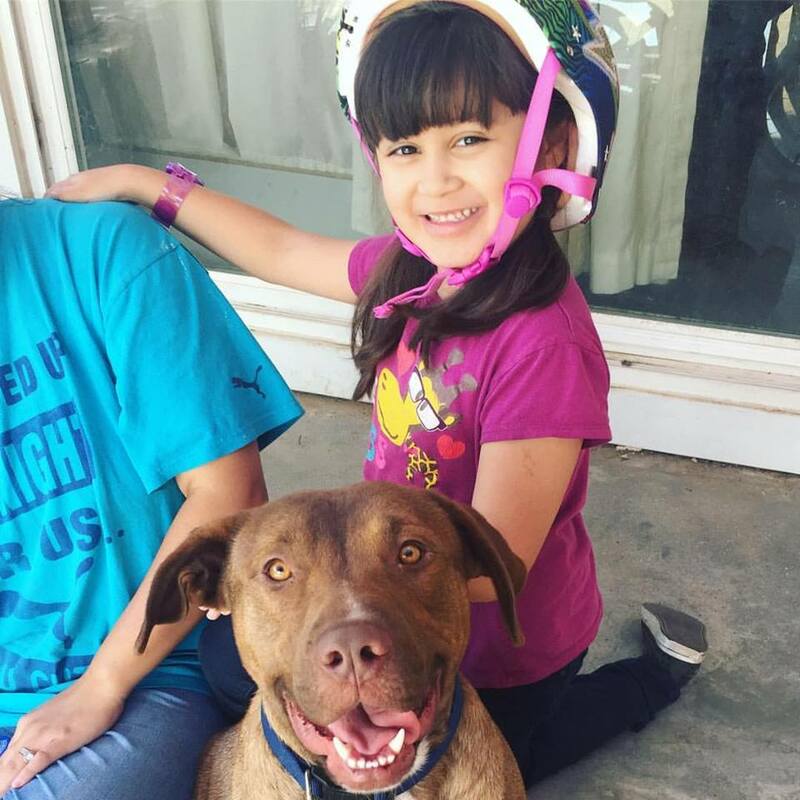 The second owners took him home and found out that their son had a severe dog allergy. So technically both returns had nothing to do with the actual dog. Elwood, because I love the name, Rocky because the girls are obsessed with Rocky Horror Picture Show, and Fantastic because all our dogs have had the last name Fantastic. The last few weeks have been an adventure to say the least. He has eaten 2 beds, learned how to escape his crate and gotten out of his collar/leash twice. Joey and I have spent the last few weekends working on the backyard so that he has a nice place to be. We reinstalled the dog door and Louie has found a new BFF. I also have never heard him bark. Joey has heard him, but only twice. Having a dog has been an adjustment, but we are all really loving having him. We waited a long time to get a new dog. Roo running away while being dog-sat was so heartbreaking for all of us. We were finally ready. We knew as Phi gets to those awesome tween years, hanging out with friends and all that junior high stuff, Louie was going to really feel that absence. Elwood has been a great friend to her already and even puts up with all her hugs and kisses. But I think Joey is the happiest of us all.